One of Philip Seymour Hoffman’s greatest qualities as an actor was his almost complete lack of vanity. How rare and special it was to encounter a Hollywood heavyweight unafraid of looking pitiful or unsavory, of playing characters the audience might not like, of letting it all hang out (emotionally and physically speaking). Hoffman wasn’t looking to charm, but to reveal—to show audiences the sometimes-unattractive depths of his characters, to offer a peek at the gears turning inside their heads and the bile rising through their insides. He was courageously unglamorous. 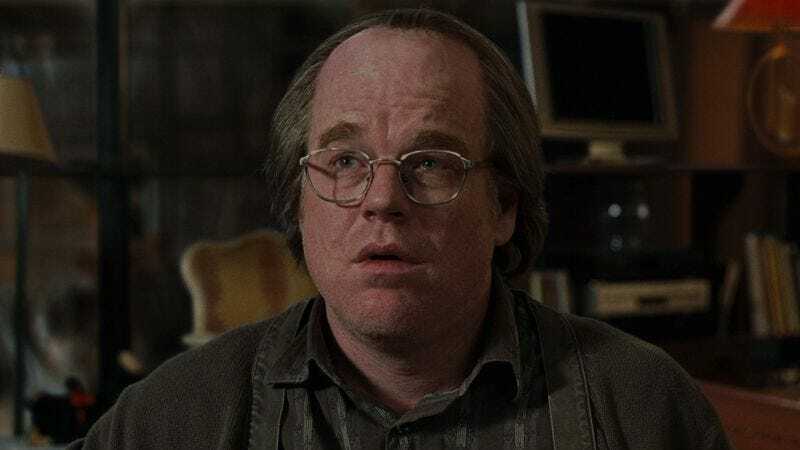 To that end, and to my mind, the quintessential Hoffman performance is the one he delivers in Charlie Kaufman’s directorial debut, Synecdoche, New York. As Caden Cotard, a theater director experiencing what can best be described as an entire-life crisis, Hoffman operates in an evolving, but near constant state of unhappiness. Early on, his character is diagnosed with a series of vague maladies, of unusual corporeal betrayals, and the actor—in one of his most physically demanding roles—makes each ailment seem like an extension of his insecurity. (He has a violent, terrifying seizure, suffers through several scenes with an uncontrollable leg quiver, and creates bizarre almost-slapstick comedy from a chronic lack of saliva.) Anxiety—of a romantic, artistic, and medical nature—is Caden’s defining trait. Hoffman simply embodies that existential unease, turning his perpetually discontent protagonist into a man fundamentally uncomfortable in his own skin. It’s an ugly sight, but there’s beauty in its honesty. Because of its preoccupation—scratch that, obsession—with mortality, Synecdoche, New York may not be the most comforting revisit for mourning Hoffman fans. (Those seeking warm and fuzzies should cue up his lovely scenes in Almost Famous instead.) But there are few better monuments to the performer’s talents than the center he provides this opus of pessimism, the way he anchors Kaufman’s increasingly surrealistic plot to recognizable human behavior. The further Synecdoche spirals into bugfuck abstraction, the more Hoffman seems to hunker down into his hopelessly self-aware hero. It’s impossible not to see Caden as a personification of Kaufman’s issues, one much less lovable than the stammering screenwriter Nicolas Cage plays in Adaptation. But it’s no hyperbole to suggest that Hoffman finds in the character, the depressed creative type incarnate, something closer to what philosophers call “the human condition.” To paraphrase the film’s off-screen opening lines, Synecdoche, New York is harsh, but truthful. The truthful part comes courtesy of Hoffman. Availability: Synecdoche, New York is available on Blu-ray and DVD (which can be obtained from Netflix) and to rent and purchase through the major digital services.